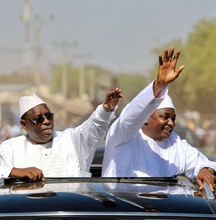 Instead of building a wall, the Gambian and Senegalese presidents jointly opened a new bridge linking the countries and the sub-continent. While the US government was partially shut down over whether to build a wall between the US and Mexico, the Gambian and Senegalese presidents jointly opened a new bridge linking the countries and the sub-continent. The bridge and the presidents’ brotherly comfort with each other was in stark contrast to the relationship between the two countries when Yahya Jammeh ruled Gambia. “Our wish is that the bridge stands, from now on, as a symbol of Senegambian unity, friendship, and love. In this context, I am pleased to disclose that the bridge is hereby named: The Senegambia Bridge,” said Gambian President Adama Barrow at the January 21 opening. Neighboring countries including Guinea Bissau and Mali are also expected to greatly benefit from the $93 million dollar project that has its roots in the mid 1950s according to The Point newspaper. "We can be proud of having turned this dream of several generations into a reality," added President Sall. “The bridge is a symbol of hope and pride for me because this will ease my movement from Soma to Farafenni to less than an hour,” said Alhassan Bah, head of the Balal Public Library - Ayuba Duleiman Diallo Education Center, which gets support from the Port Of Harlem Gambian Education Partnership. I used to take Bah three hours travel from Soma to Farafenni. The African Development Bank provided most of the funds as part of its drive for greater economic integration in the region through its flagship Trans West Africa Corridor project linking Dakar and Lagos.